Increasingly, people are annoyed by ugly noises of air heat pumps in the neighbor’s garden. Who pays when purchasing these devices only on efficiency and price, jumped too short. Especially it brings residents to the palm when the air source heat pump is directly on the plot. Here, an important shift is already possible in the preselection of the manufactured product: the sound power level gives information about the volume of the device. In practice spans 15 to 20 dB (A) are possible – the aim should be SPL of less than 50 dB (A). This figure must specify in its technical description of the device manufacturer. Main noise sources are the fan, compressor, piping and air ducts. At the fan blades, vortexes and pressure fluctuations. Slow-moving fans generate less noise. The speed should be controllable – it could, for example be reduced at night. What is important, on the cross section of the air ducts. Larger cross-sections to reduce the flow velocity of the air stream. The compressor, also called compressor, generates both air and solid-borne sound. It results in free vortex at the inlet and outlet openings and turbulence in the flow around obstacles and edges. solid-borne sound is avoided by a vibration-isolated installation, as well as by rubber buffer bearings, noise protection plugs and curved hoses. The most effective protection should provide a complete enclosure of the unit. Inlets and outlets are to be isolated acoustically. 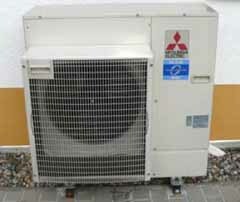 Ideally, air heat pumps as far as possible away to set up the neighborhood. The wind direction has an influence on the transmission of sound. The west-east direction is particularly critical. The orientation of the fan should not directly access the next residence, but at a 90 – degree angle done. In winter, the heat pump requires more current than in summer. Therefore also buzzing louder. The noise test in the winter is the safer option. A dialogue with the neighborhood is advised. A compliance with the noise standard is not always sufficient. Nevertheless, a annoying buzzing sound bring the neighborhood so on the palm that harmonious coexistence is no longer given. This entry was posted in environment and tagged air-heat-pumps, noise protection on 2014/05/02 by joachim-w.